The built-in Cinemagraph Pro for macOS transform tools will allow you to crop, straighten, rotate, and flip your cinemagraphs. Crop | Drag the white markers to select your crop and remove unwanted areas from your cinemagraph. Click on the lock icon to unlock and lock the scale of your crop. You can also use the keyboard shortcut ⌥ (Option) to adjust the size while maintaining scale when unlocked. 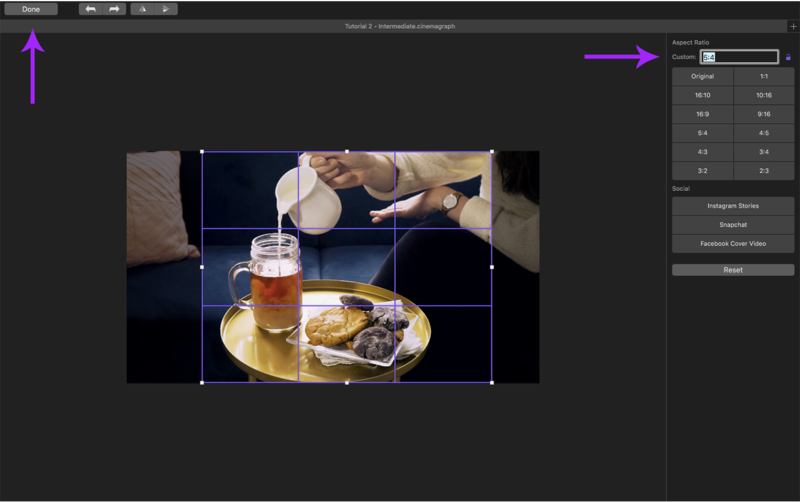 Select one of the aspect ratio presets to crop your cinemagraph to optimize your cinemagraph for social media. You can also enter a custom aspect ratio instead. Straighten | Hover outside the white corner markers to reveal until you see the angled arrow symbol. Drag to straighten your cinemagraph on either axis. Rotate | Use the rotate left and right commands to rotate your cinemagraph 90°, 180° and 270°. You can also use the keyboard shortcuts ⌘→ and ⌘← to rotate your cinemagraph. Flip | Use the flip vertical and horizontal commands to flip your cinemagraph on the corresponding axis. The flip vertical command will flip your cinemagraph up and down on the vertical axis. The flip horizontal command will flip your cinemagraph right and left on the horizontal axis and create a mirrored effect. Select Reset to undo all changes you've made under the crop tab. Select Done when complete to apply the changes.